09-Feb-2013 -- This confluence visit is the fifth out of a series of 15 visits in Malaysia and Thailand. The previous confluence is 5°N 103°E. It is in turn part of a 4-month bicycle trip starting in Tasmania at 43°S 146°E. The Thai Provinces of Narathiwat, Yala and Pattani had a travel warning due to bomb attacks and were running under emergency legislation. So I originally planned to circumnavigate these provinces by crossing over to the west coast. When I asked locals about the safety conditions in those areas, I got diverse answers. In this conflict, tourists were not a target and when I read that no tourists had been involved yet, I decided to go. In this case, I not only got an additional adventure but I also shorted the route by 200 km and, last but not least found this confluence point to be located just 350 m from my route. In the morning of confluence day, I started in the town Jerteh (70 km from CP) at 7:15 AM and reached the minimal distance of 350 m to the confluence from national road no.3 at 11:30 AM. From there, an asphalt street directly leads to the confluence point through the Kampong Tasek Kedotak. This street is quite busy with people and shops, but gets a little quiet at the confluence point. The street misses the confluence by only 7 meters. 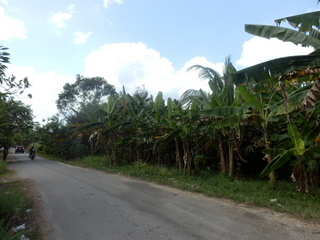 It looked like that the confluence would be in a banana plantation, but there is only one row of banana trees. The confluence is behind those banana trees down in a swamp. I was able to climb down and get within 1 meter to the exact location. In order to get all-zeros-reading I would have needed rubber boots. The swamp is used as a rubbish dump and the water has become a hypoxic dead zone. The colorful water surface suggests that oil was among the dumped waste. Already ten years ago, this confluence has been a place for dumping stuff, as can be concluded from previous visits. On the other side of the street, there are residential areas. The only - very little - highlight was the sapodilla fruit. After the documentation I cycled the remaining 5 km to the border and crossed into Thailand. More pictures of the trip can found at mautz.net. The story continues is at 8°N 100°E.